Lenzie on the attack against Strathendrick (pic by Jamie Forbes). 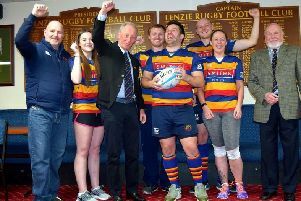 Lenzie went down 21-17 at home to Strathendrick in their BT West Division 2 match on Saturday. Strathendrick dominated the first 10 minutes of the game and went into an early 10-point lead following good rucking and possession. After a slow start Lenzie took control and were unfortunate not to score several tries when desperate defence kept wingers Shearer and Wallace out. Lenzie eventually scored when McCrae quickly tapped a penalty and scored from close range to bring the score to 10-7 at the break. The large home support expected Lenzie to control the second half which they did but were not rewarded with any points when they scored two clear tries only to find the referee unsighted. Another quickly taken penalty by McCrae released Scouller to score easily to put Lenzie in front at 12-7. However Lenzie failed to clear from the kick-off and the visitors scored under the posts when Haddow’s kick was charged down to regain the lead at 14-12. The home side continued to dominate possession despite Strathendrick fiercely contesting at the break down and Scouller scored again when he powered through the visitors' defence. With a slender 17-14 lead Lenzie continued to attack the visitors’ line with a bonus point in sight. However it was Strathendrick who stunned the crowd and Lenzie players when they broke out of defence and scored an excellent team try in the final minutes. The result means much to ponder for Lenzie’s coach Le Mar for next week’s visit to Waysiders/Drumpellier. Strathendrick are at home to Strathaven. Allan Glen’s continued their winning start to the season with a 70-14 victory at Oban Lorne. The win put Glen's a point clear of Carrick and Garnock at the top of the BT West Division 1 table after three games. This Saturday Glen's are at home to East Kilbride.